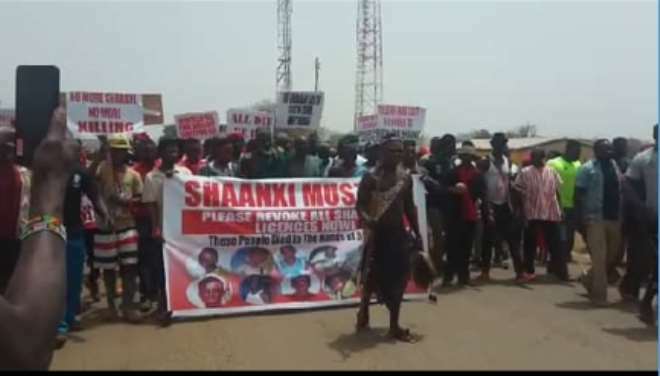 A group calling itself Concern Citizens of Talensi (CCT) has held a massive demonstration to protest against the presence and operations of a Chinese mining company, Shaanxi, in Talensei District of Upper East. Shaanxi, which is supposed to be giving mine support services to two small scale mining companies namely Pubortaaba and Yenyeya in the region is alleged to have killed a total of 61 indigenes through the blasting of dynamites and poisonous gaseous substances since they started operations in 2012. Readers would recall that recently Shaanxi mine-blast claimed some 17 lives on 23rd January this year, which led to the temporal closure of the Chinese company pending investigations. 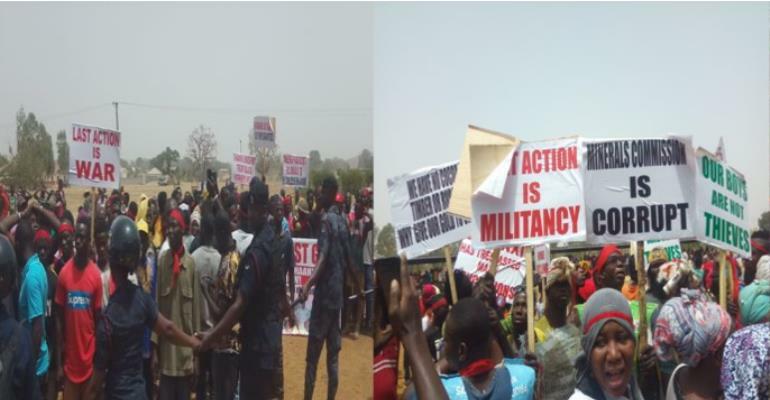 The CCT’s demonstration which was considered to be the biggest protest to have ever hit the soils of Talensi pulled together several hundreds of young men, women and even the aged who were believed to be friends and relatives of the victims, to vent their spleen on the Chinese and some political heads. The group pressed home their demand for the immediate revocation of the licenses of Shaanxi and the two other companies they provide mine support services to as well as the evacuation of the Chinese nationals from the district as was the chants and the inscriptions on some of the placards they hoisted. A banner which is about the size of two windscreens of a vehicle put together also displayed pictures of some of the 61 people said to have died through “reckless” handling of mining explosives by the Chinese. Other placards contained warning statements like “Next action is militancy”; “Last action is war”; “All die be die”; and “No Ghanaian can do this in China. Why Ghana?” among others. Leaders of the demonstration in their statement pointed accusing fingers at some “politician in and outside the region whom we thought would have helped resolve the longstanding conflict are rather in bed with the Chinese”. They also raised four key points in their statement asking that; “is the Ghana Revenue Authority(GRA) in Bolga not aware of Shaanxi’s existence and operation in Talensi?, why has the Minerals Commission compromised by shielding Shaanxi after all the gold they have extracted all these years, why has the Upper East Regional Police Commander stationed police post at the Shaanxi mine site when the entire Talensi crave for police security and lastly why has sector Minister not revoked the license of Shaanxi after they committed serious offences leading to deaths in the past”. 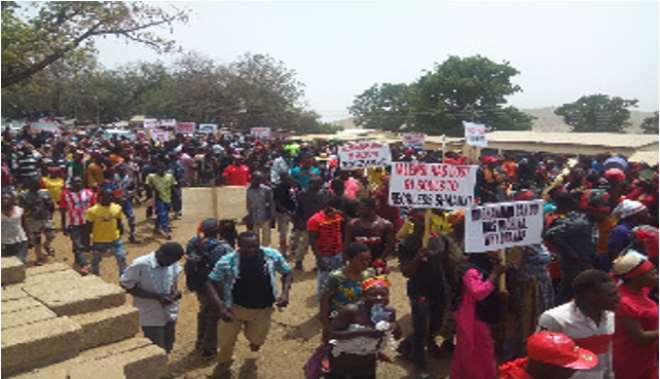 The CCT marched from Talensi through to Bolgatanga the regional capital and finally ended up at the office building of the Regional Coordinating Council (RCC) where they were supposed to meet the Regional Minister or his representative as arranged to present their petition against Shaanxi but met his absence and they were not ready to deal with the DCE because they claimed he is corrupt. “It was promised to us that if we got here and the Regional Minister is not around, they will bring somebody from the Regional Coordinating Council to receive the petition on behalf of the minister. We have gotten here and they are not here. 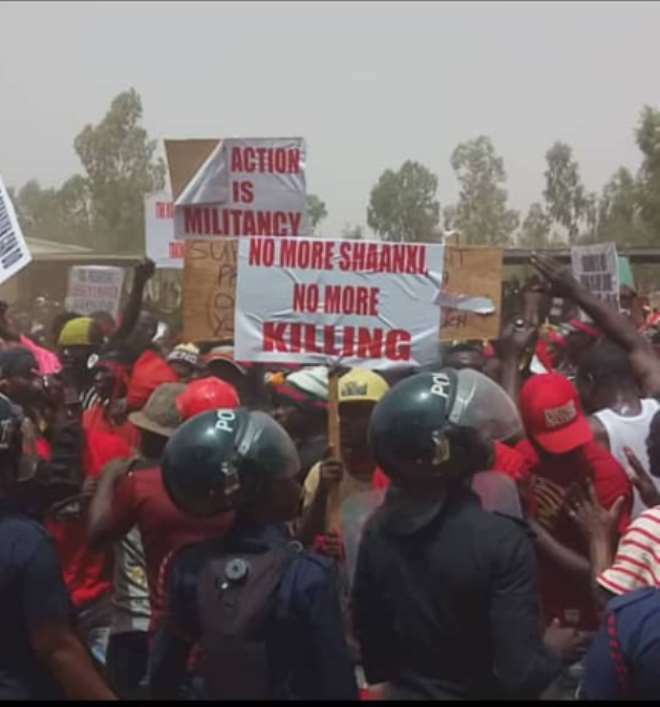 If the Regional Minister and the security will mislead us, we will send the petition to Shaanxi and the problem will be solved,” said by the acting Upper East Regional Chairman of the Ghana Small-Scale Miners Association, Robert Tampoare who was clearly fuming. The police controlled the tension that was building up at that point and then an alternative arrangement was made for the Assistant Director of Administration at the RCC, Andrew Akumbutum to receive the petition on behalf of the Minister whiles another was dispatched to the office of President of the Republic same day.